Reading and share top 8 famous quotes and sayings about The Moon Goddess by famous authors and people. 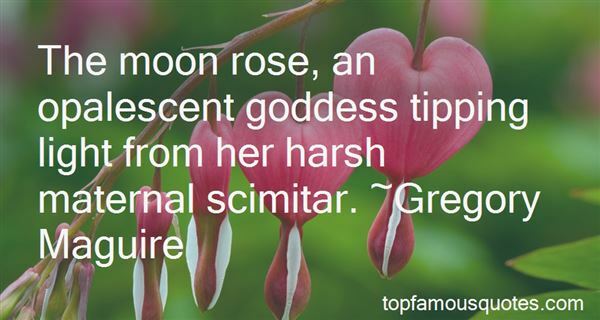 Browse top 8 famous quotes and sayings about The Moon Goddess by most favorite authors. 1. "This night is not calm; the equinox still struggles in its storms. The wild rains of the day are abated; the great single cloud disparts and rolls away from heaven, not passing and leaving a sea all sapphire, but tossed buoyant before a continued, long-sounding, high-rushing moonlight tempest. The Moon reigns glorious, glad of the gale, as glad as if she gave herself to his fierce caress with love. No Endymion will watch for his goddess tonight. there are no flocks out on the mountains; and it is well, for to-night she welcomes Aeolus." 2. "She felt that there was a tide within her, moving with the power of the moon and the ocean and the goddess, who had bound them together, rising, cresting within her heart untill she thought that she must weep, or laugh, or both. she felt her world shifting, remaking itself; holding on to all she was and all she known, but creating a space within these things for this man she was holding in her arms, so that he might share it with her, bringing to it all that he was and all that he had known. And in that instant, in the eternity of that kiss, Alayna knew, with a joy that she found frightening even as it encompassed her, that her life would never again be as it had been." 3. "Brassa,' she whispered, 'what is the moon? Why does it grow in the sky? 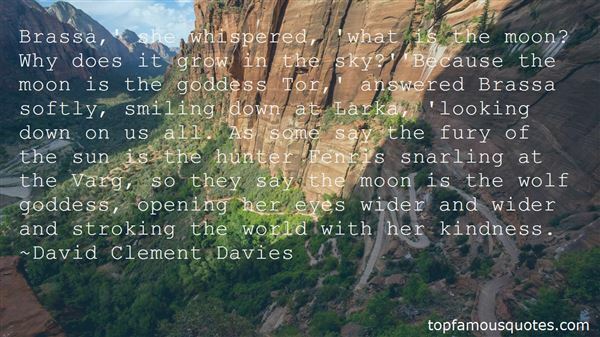 ''Because the moon is the goddess Tor,' answered Brassa softly, smiling down at Larka, 'looking down on us all. As some say the fury of the sun is the hunter Fenris snarling at the Varg, so they say the moon is the wolf goddess, opening her eyes wider and wider and stroking the world with her kindness." 4. "The moon rose, an opalescent goddess tipping light from her harsh maternal scimitar." 5. "If there must be a moon, let it be high,a high moon made in Baghdad, neither Arab, nor Persian,nor claimed by the goddesses all around us." 6. 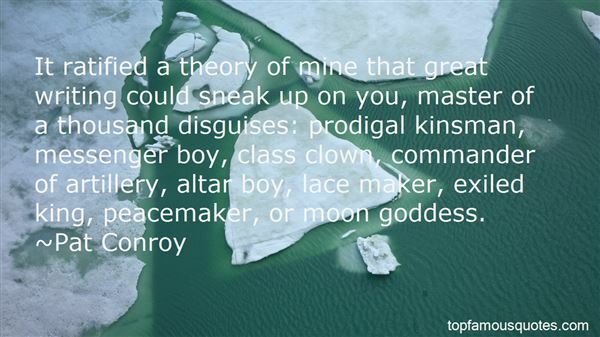 "It ratified a theory of mine that great writing could sneak up on you, master of a thousand disguises: prodigal kinsman, messenger boy, class clown, commander of artillery, altar boy, lace maker, exiled king, peacemaker, or moon goddess." 7. "The day of the full moon, when the moon is neither increasing nor decreasing, the Babylonians called Sa-bat, meaning "heart-rest." It was believed that on this day, the woman in the moon, Ishtar, as the moon goddess was known in Babylon, was menstruating, for in Babylon, as in virtually every ancient and primitive society, there had been since the earliest times a taboo against a woman working, preparing food, or traveling when she was passing her monthly blood. On Sa-bat, from which comes our Sabbath, men as well as women were commanded to rest, for when the moon menstruated, the taboo was on everyone. Originally (and naturally) observed once a month, the Sabbath was later to be incorporated by the Christians into their Creation myth and made conveniently weekly. So nowadays hard-minded men with hard muscles and hard hats are relieved from their jobs on Sundays because of an archetypal psychological response to menstruation." 8. "To diminish the worth of women, men had to diminish the worth of the moon. They had to drive a wedge between human beings and the trees and the beasts and the waters, because trees and beasts and waters are as loyal to the moon as to the sun. They had to drive a wedge between thought and feeling...At first they used Apollo as the wedge, and the abstract logic of Apollo made a mighty wedge, indeed, but Apollo the artist maintained a love for women, not the open, unrestrained lust that Pan has, but a controlled longing that undermined the patriarchal ambition. When Christ came along, Christ, who slept with no female...Christ, who played no musical instrument, recited no poetry, and never kicked up his heels by moonlight, this Christ was the perfect wedge. Christianity is merely a system for turning priestesses into handmaidens, queens into concubines, and goddesses into muses." I'm not really a mass market writer."